So recently I had the pleasure of working on an excellent short film script written by a friend of mine, Stephan Drury, and as I hadn’t written a post on here in well over a month it seemed a fitting topic to talk about. Needless to say, this was one of the most challenging projects in terms of lighting, not only because we had to work with an unusually sunny forecast but because we started losing light every day around 5pm. Shot mostly on Teele’s 5D Mark II, we managed to shoot in some very low light and difficult-to-reach places (such as Stephan’s rather grotty loft space) which again proved the benefits of using a DSLR. I helped out with lighting and camera and did some B-roll shooting on the 60D. The film’s fantastic cast were Mark Jackson, Alex Aires and Jacob James Beswick who all excelled in their roles in the film. 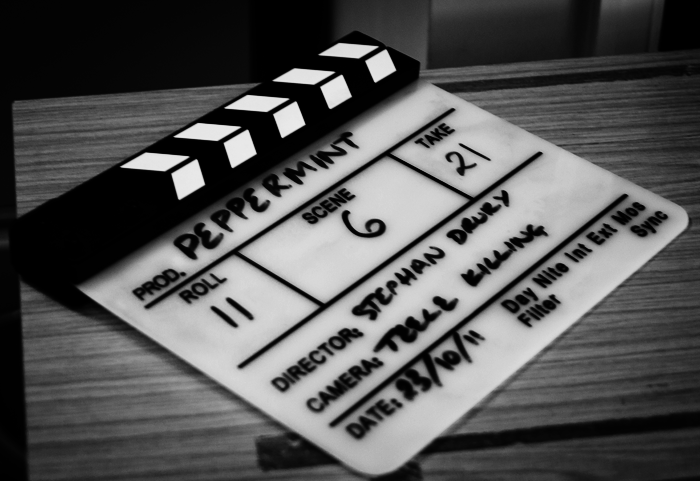 At this early stage of post-production we can’t let too many cats (or should I say rats) out of the bag but expect to see Peppermint at film festivals and competitions across the UK and beyond! Also, if you’re looking to hire sound equipment in East Anglia and, like us, have found rental companies are few and far between around here head over to Rookery Productions Facebook page for enquiries; kit includes Rode NTG2 mic/ boom/ dead cat/Edirol R-44 four-input audio recorder/ lav microphones x2 (wired)/Beyerdynamic DT770 headphones: £35/day, £450 deposit +insurance +delivery.